People always complain death in comics is cheap, which is true: like Will West says, you can get just as much mileage out of a coma, and the character eventually returning is much more believable. So good on Marvel for just putting Tony in a coma at the end of Civil War II. 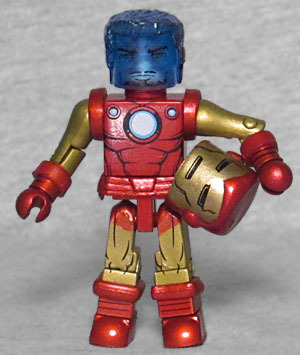 This figure is basically Classic Iron Man with a metallic finish and a translucent blue head. There's a face printed on there, but it's hard to see. The figure doesn't get a repulsor blast hand, but there is a two-footed flight stand for him to use. 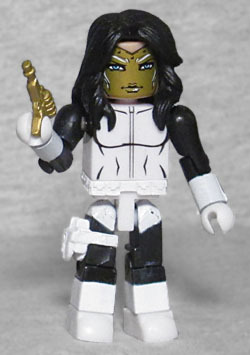 There's something about Madame Masque's costume that really works wonderfully as a Minimate. The black-and-white bodysuit, the flowing black hair, the golden mask tampographed on her head rather than being a separate piece... it's all terrific. Like, the Tony in this set isn't anything to set the world on fire, but Whit looks outstanding. She has a holster on her right leg, and a small pistol that's the same gold as her mask. She's even wearing a white utility belt, to keep the figure from looking too plain. The toy is a balance of simple and complex, of detailed paint and just enough molded pieces to create the look needed. There are nearly a thousand figures in the Marvel Minimates line, but this one is top-tier. In the Avengers 1,000,000 BC reviews, we wondered whether those figures were rescued from Toys Я Us. Well, those may not have been, but we can say for certain that these three two-packs were. If there were any question of that, the "TRU26" serial number on the back of the box makes it clear. That's probably also why these sets are only available via Walgreens' website: even if it's gone now, Walgreens probably wasn't too keen on carrying something on their shelves that even indirectly promoted a different store.